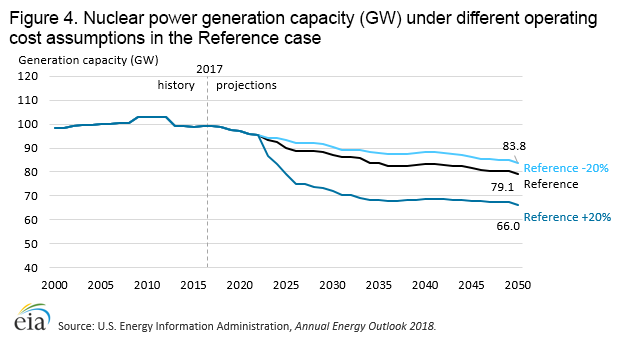 In EIA’s Annual Energy Outlook 2018 (AEO2018) Reference case, U.S. nuclear power generating capacity is projected to decline from 99.3 gigawatts (GW) to 79.1 GW over the projection period of 2017–50. To address some of the uncertainty surrounding this projection, this article presents sensitivity cases under different assumptions for oil and natural gas availability, nuclear power unit costs, and carbon policies. The uncertainty related to higher or lower levels of natural gas availability as addressed in the High Oil and Natural Gas Resource and Technology case and the Low Oil and Natural Gas Resource and Technology case. The uncertainty of lower or higher operating and capital costs for both new and existing nuclear units. The uncertainty of alternative levels of carbon emissions regulation, as represented by different fees on the emissions of carbon dioxide (CO2). When natural gas prices rise faster and higher, as projected in the LRT case, nuclear capacity retirements decline by 3.9 GW though 2050 to 22.3 GW, compared with approximately 26.2 GW of nuclear retirements in the Reference case. 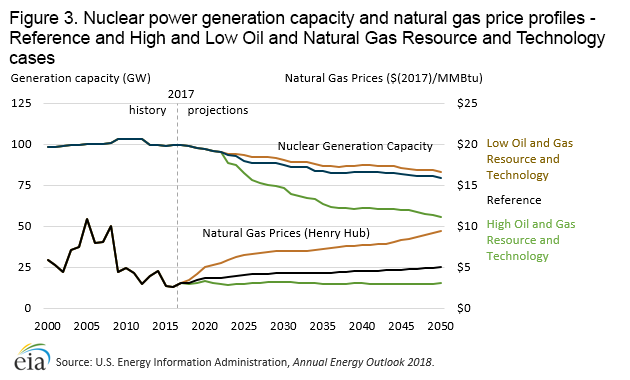 In contrast, in the High Oil and Natural Gas Resource and Technology (HRT) case, where natural gas prices are estimated to remain near 2017 levels, nuclear power plant retirements increase by 23.8 GW through 2050 to 50.0 GW. 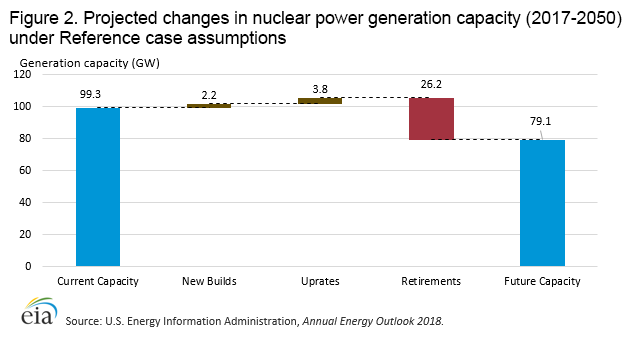 When nuclear unit operating costs increase or decrease by 20%, retirements increase or decrease across all of the sensitivity cases, accordingly. With 20% higher costs, retirements by 2050 increase by slightly more than 4.2 GW in the LRT case; however, they increase by 13.1 GW and 37.2 GW in the Reference case and in the HRT case, respectively, under 20% higher cost conditions. In contrast, decreasing nuclear power plant costs by 20% results in 2.6 GW less retirements in the LRT case, 4.7 GW less retirements in the Reference case, and 23.6 GW less retirements in the HRT case. 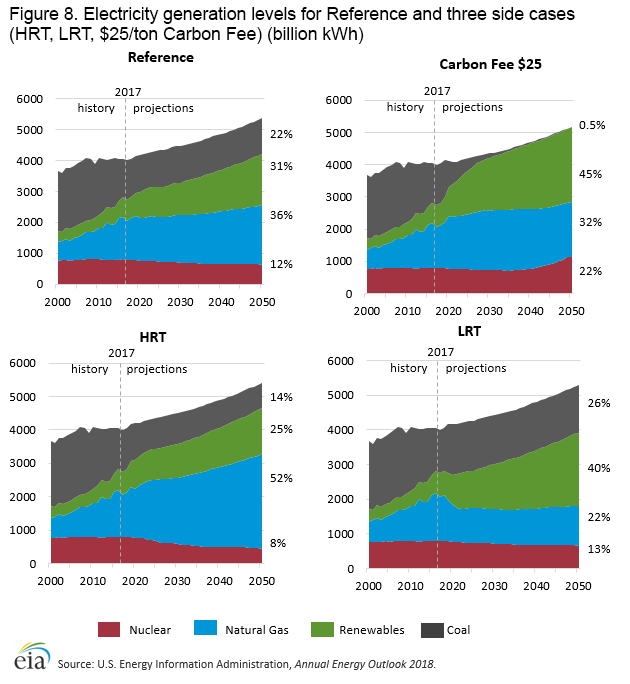 Under the carbon fee scenarios, nuclear power plant retirements decline and new nuclear power capacity is added after 2037, with total fleet capacity ranging between 27.3 GW and 65.7 GW higher through 2050, depending on the magnitude of the carbon fee. These sensitivity analyses do not address all of the future market developments that may affect nuclear power. Other uncertainties include new state policy assumptions on renewable portfolio standards, clean energy strategies, price support for financially at-risk nuclear power plants, investments to address grid congestion, and other energy-related federal policies. In addition, nuclear waste management is not modelled in EIA’s National Energy Modeling System (NEMS) because it is funded through the nuclear waste fund and has no effect on plant-level economics. Further, the issue of social license where public opinion, at both the local and state levels, can influence state policy and legal actions is not directly modelled in NEMS. However, social licensing can be seen as a contributing factor to the recent announced plant closings and project decisions that are represented in NEMS as well as the New York and Illinois zero-emission credit (ZEC) legislations. The structure of the electricity markets, recent developments in the domestic nuclear power industry, and the diversity of plants in the nuclear fleet all need to be examined when considering projections of nuclear capacity, generation, and retirements. Of the 60 nuclear plants operating in the United States (Figure 1), 31 generate and sell electricity into deregulated (i.e., merchant) wholesale electricity markets, where they compete with other generating capacity resources at the sub-regional level. In merchant markets, wholesale electricity prices are determined using locational marginal pricing, which accounts for the effects of load and generation patterns, transmission constraints, and the generation mix at specific nodes on the system. As a result, each nuclear plant will experience its own pricing environment. Combined with their own unique operating costs, merchant nuclear power plants experience a range of financial conditions, as reflected by the diverse set of recent and announced early retirements of nuclear power plants. Natural gas used for electricity generation has increased and replaced a large portion of coal-fired generation, resulting in the retirement of some coal plants. The continued growth in the production of low-cost natural gas from shale and other tight source rock, particularly in the Marcellus and Utica formations in West Virginia, Pennsylvania, and Ohio, is providing electricity generators a lower-cost alternative that has resulted in lower wholesale electricity prices. Some electricity markets experienced a 40% drop in wholesale electricity prices from 2007 to 2016. In addition, the growth in the use of renewables, namely wind and solar, and relatively flat growth in electricity demand has created increased competition and lower electricity prices in wholesale power markets. Nuclear power plants operating in merchant markets are experiencing lower electricity prices, which can, if low enough, result in unprofitable conditions. Since 2013, five nuclear plants have closed. In 2017, four plants reversed their closing decisions after receiving state price supports in the form of zero-emission credits. Six nuclear plants are scheduled to permanently shut down by 2025 for economic reasons, some in conjunction with necessary, major capital improvements required by federal or state regulators. Five additional nuclear plants have also requested state-level price support. Before 2013, the last nuclear power reactor to close was the 660-MW Millstone Unit 1 reactor in 1998. According to reported statements by the owner, the decision to permanently close the reactor was based on a risk-adjusted net present-value assessment of the reactor operating in a newly-created, deregulated market where the estimated annual revenue would be less than 1% of the anticipated cost of restoring the unit to commercial operations. The Indian Point nuclear plant in New York is scheduled to retire in 2021 due to environmental and safety concerns. Indian Point is a two-unit plant supplying approximately 12% of the state’s electricity demand. In January 2018, the California Public Utilities Commission voted to approve a plan to close the Diablo Canyon Nuclear Power Plant in 2025. Based on several news reports, the commission concluded that the plant would soon become uneconomical to operate due to changes in the power grid – growth in renewables, increases in energy efficiencies, cost-prohibitive capital investments to develop an alternative cooling system, and the development and increased use of local electricity suppliers. For example, in October 2015, Governor Edmund Gerald Brown Jr. signed into legislation Senate Bill 350, which requires retail sellers and publicly-owned utilities to procure 50% of their electricity from eligible renewable energy resources by 2030. New York and Illinois passed legislation in 2016 and 2017, respectively, that provides ZECs for nuclear power plants experiencing unprofitable market conditions. The ZEC values are calculated based on plant financial shortfalls, are capped, and expire in 12 years in New York and 10 years in Illinois. [13,14] As a result of these laws, the announced closing decisions for R. E. Ginna, Nine Mile Point, and Fitzpatrick nuclear power plants in New York and for Clinton and Quad Cities nuclear power plants in Illinois were reversed. [15,16] Connecticut, New Jersey, Pennsylvania, and Ohio are considering similar types of measures to support nuclear reactors in their states. The most recent addition to the nuclear fleet was the Watts Bar Unit 2 reactor in eastern Tennessee in 2016. The next-youngest operating reactor is Watts Bar Unit 1, which entered service in 1996. The construction project of two nuclear power reactors (Westinghouse AP-1000 design) at the Vogtle nuclear plant in Georgia has incurred significant project cost escalations and schedule delays. Following a project review in 2017, Georgia Power and its public-power partners opted to continue construction of the Vogtle plant and recently received approval to do so from the Georgia Public Service Commission. Conversely, the owners of the South Carolina V. C. Summer plant decided to terminate the construction of two AP-1000 design reactors that were also experiencing similar cost escalations and schedule delays. Both the Georgia and South Carolina projects had the same reactor design, contractor, and construction strategy. These licensees have not submitted plans to proceed further. According to the Nuclear Energy Institute, the nuclear power industry has implemented a coordinated strategy “to transform the industry and ensure its viability for consumers as well as its essential role in protecting the environment.” That strategy includes identifying areas to reduce costs with a target of reducing overall nuclear plant operating costs by as much as 30%. The announced retirements, new builds, project cancellations, reversal of closure decisions, and ZECs are all included in the AEO2018 Reference case. Projections for U.S. nuclear power capacity through 2050 differ measurably across the AEO2018 cases (Table 3). The 2050 projected capacity ranges from 18.1 GW in the HRT case (with 20% higher nuclear power costs) to 144.9 GW in the $25/ton CO2 case, and the Reference case is near the midpoint of the two extremes at 79.1 GW. The results of the sensitivity cases indicate that ranges selected for both the competing natural gas fuel price and nuclear power unit costs have a measurable effect on the rate of nuclear power plant retirements and new builds. Note: Nuclear generation capacity in 2017 was 99.3 GW. 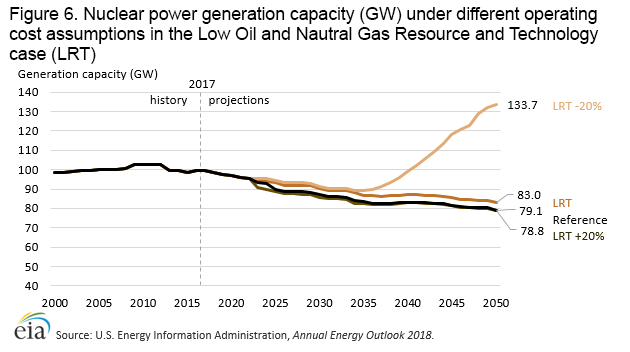 The Reference case projection assumes trend improvements in known technologies along with EIA’s current view of economic and demographic trends. The Reference case also assumes that current laws and regulations affecting the energy sector, including sunset dates for laws that have them, are generally unchanged throughout the projection period. The potential impacts of recently-enacted or proposed legislation, regulations, and standards are not included. Projections in the AEO should be interpreted with a clear understanding of the assumptions that inform them and the limitations inherent in any modeling effort. 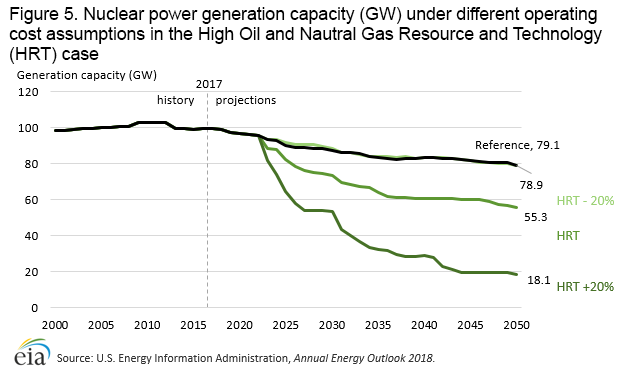 In the AEO2018 Reference case, nuclear power generation capacity is projected to decline from 99.3 GW in 2017 to 79.1 GW in 2050. New builds through the projection period are limited to the construction of Vogtle Units 3 and 4, which are already under construction and will provide 2.2 GW of additional capacity. EIA also projects that, through 2040, capacity uprates across the fleet will be approximately 3.8 GW. These incremental additions are outweighed by the announced retirements, anticipated retirements, and plants modeled as uneconomic, which totals approximately 26.2 GW (Figure 2). No new builds, except for the Vogtle units currently under construction, are projected in the Reference case, where natural gas prices rise 65% through 2050 and nuclear power operating costs increase slightly. Both the HRT and LRT cases demonstrate how varying natural gas prices (compared with the Reference case) may affect the level of future nuclear power generation. The increased use of low-priced natural gas for baseload electricity generation has resulted in lower wholesale electricity prices in several merchant markets where nuclear plants compete. Lower natural gas prices in the HRT case result in lower electricity prices, and approximately 23.8 GW of additional nuclear power becomes unprofitable. By comparison, higher natural gas prices in the latter years in both the Reference and LRT cases provide sufficient revenues to prevent most units from retiring. Higher natural gas prices for the electric power sector in the LRT case ($9.42/million British thermal units (MMBtu) by 2050, compared with $5.01/MMBtu in the Reference case ($2017)) reduce early retirements by 3.9 GW though 2050 to 22.3 GW compared with 26.2 GW in the Reference case. Lower natural gas prices in the HRT case ($3.02/MMBtu by 2050) increase early retirements by 23.8 GW to 50.0 GW in the Reference case. Without nuclear power unit cost reductions, all three cases show continued nuclear power retirements through 2050 (Figure 3). The three cases include 6.0 GW of new capacity from new builds (2.2 GW) and power uprates (3.8 GW) in the projection period (2018–2050). To understand unit cost impacts, EIA varied operating costs under three significantly different scenarios, the Reference, HRT, and LRT cases. For each of these scenarios, unit operating costs were raised or lowered by 20% when compared to operating costs in the Reference case. The 20% change in costs applies to both the operating and maintenance costs for existing units, as well as the capital, operating, and maintenance cost assumptions for any modelled, unplanned nuclear capacity. These cases illustrate the challenges and opportunities facing the nuclear power sector. In the Reference case, lowering plant operating costs by 20% decreases retirements by nearly 5 GW or 18% (Figure 4). However, raising plant operating costs by 20% from those used in the Reference case, increases retirements by nearly 50% to 39.3 GW, with total nuclear capacity decreasing to 66.0 GW by 2050 in the Reference case. The changes in nuclear power plant costs have a larger impact on early retirements in the HRT case, where natural gas prices remain historically low. In this case, a 20% higher nuclear plant capital and operating costs results in 37.2 GW of additional retirements through 2050 (Figure 5). In contrast, lowering nuclear plant operating costs 20% in the same case reduces the number of early retirements with lower natural gas prices. The 2050 nuclear generation capacity is 78.9 GW in the HRT with 20% cost reduction case compared with 79.1 GW in the Reference case. Conversely, higher natural gas prices in the LRT case results in 3.9 GW of additional retirements by 2050. However, when nuclear plant operating costs in the LRT case are reduced by 20%, a net of 44.5 GW of capacity is added between 2035 and 2050 (Figure 6). Two Carbon Fee cases were also simulated to quantify the effect of carbon fees on nuclear power generation. Competing fossil fuels such as coal and natural gas would be subject to the carbon fee, while nuclear power would not. These fees increase the fuel price profiles for natural gas and coal and can result in higher average wholesale electricity prices in markets that use coal or natural gas. 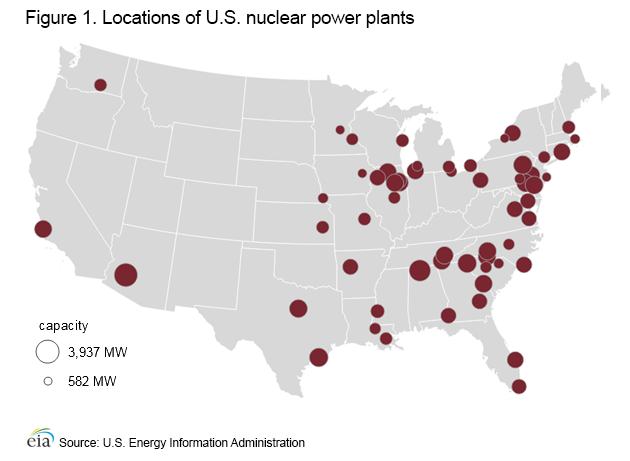 As a result, the nuclear plants in those markets would become increasingly competitive. In the cases examined, the carbon fee was modeled to begin in 2020 at either $15 or $25/ton CO2 ($2017), increasing by 5% each subsequent year in real dollar terms. Under a $25/ton CO2 fee scenario, 59.1 GW of new nuclear power capacity is added through 2050. If the starting fee is lowered to $15/ton, 24.3 GW of new nuclear power capacity is added (Figure 7). In the lower and higher Carbon Fee cases, early retirements are reduced by 3 GW and 7 GW, respectively, by 2050. Also, compared to the lower carbon fee case, the higher carbon fee case results in 34.8 GW of additional new nuclear builds by 2050. Although nuclear capacity and generation are affected, the changes in natural gas prices or CO2 fees in the sensitivity cases result in more pronounced changes to the other fuels and technologies used to generate electricity. Even though the LRT and Carbon Fee cases result in more nuclear generation when compared with the Reference and HRT cases, the generation mix differs across all of the sensitivity cases. These trends are reflected in the electricity generation mix under the scenarios shown in Figure 8 and in the changes in generation by fuel relative to the Reference case reported in Table 4. Lower-priced natural gas in the HRT case increases coal and nuclear plant retirements and slows the deployment of renewables as natural gas generation widens its share of total electricity generation from 36% in the Reference case to 52% by 2050. Higher-priced natural gas in the LRT case expands the share of renewables in total generation in 2050 from 31% in the Reference case to 40% and reduces the level of coal and nuclear plant retirements. CO2 fees increase the cost of generation from coal and natural gas, thereby increasing the relative competitive position of electricity generation from nuclear and renewables. In the $25/ton Carbon Fee case, the current trend of decreasing coal generation accelerates, declining to less than 1% of total generation by 2050 compared with 22% in the Reference case. Renewables increase the most in the higher carbon fee case as the current growth in renewables accelerates through 2027 then continues to grow steadily through 2050, reaching 45% of generation. Natural gas-fired generation is lower compared with the Reference case in 2050 (32% vs 36%) in the high carbon fee case. 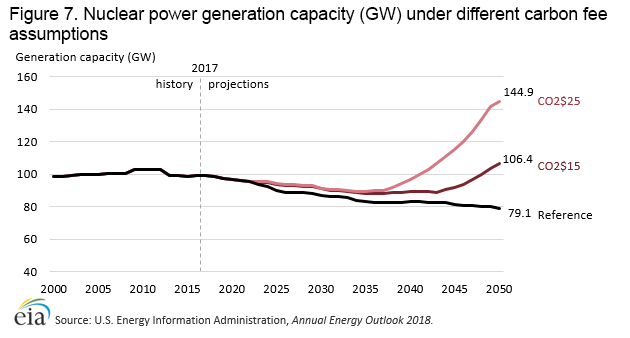 Starting in 2035, nuclear power also benefits as generation capacity grows significantly from 89 GW in 2035 to 145 GW by 2050, representing 22% of total generation and 80% more nuclear-powered generation compared with the Reference case. The generation composition in the HRT case differs from the Reference case with 48% more natural gas, 34% less coal, 17% less renewables, and 30% less nuclear power by 2050. In the LRT case, nuclear power generation is 4% higher than the Reference case and natural gas generation is 40% lower. Most of the reduced natural gas-fired generation in the LRT case is compensated by 28% more renewable generation and 18% more coal-fired generation. These generation trends indicate that a similar percentage of nuclear plants are unprofitable even when electricity prices are higher compared with the Reference case. Michael Scott is the lead analyst for nuclear power at the U.S. Energy Information Administration, where he analyzes nuclear energy supply, demand, and prices including the impact of financial markets on energy markets; develops models and writes reports and articles on nuclear power; and supports EIA electricity market modeling and projections. Previously, Michael was an EIA analyst for oil and natural gas production, including natural gas liquids. Between 2002 and 2013, Michael was a senior program analyst in the Office of the Chief Financial Officer in the Department of Energy focusing on departmental program performance and conducting independent project finance assessments for the Loan Guarantee program’s credit committee. From 1978 to 2002, Michael served in the U.S. Air Force that included conducting flight tests, modeling and directing weapons and weapons phenomenology tests, conducting semiconductor research, and teaching at both the USAF Academy and Institute of Technology. Michael holds multiple degrees including a PhD in physics and is an internationally published author in physics and mathematics. Oil and natural gas availability, nuclear power unit costs, and carbon policies are among the key uncertainties to the outlook of nuclear power.